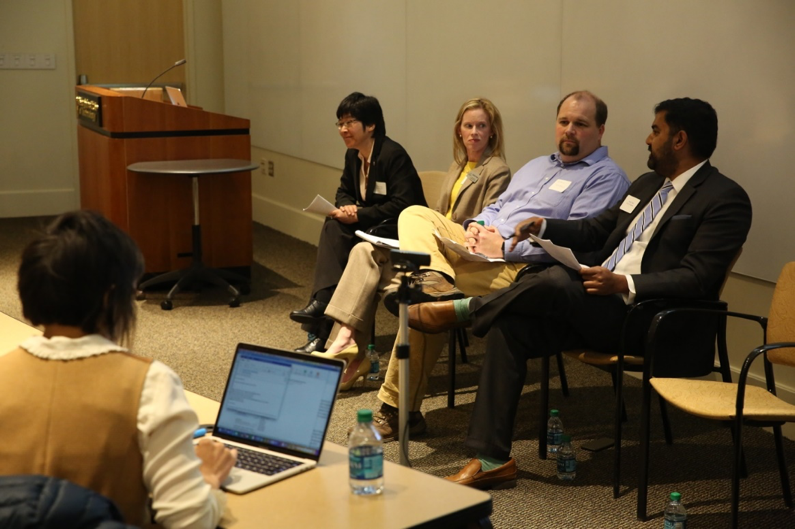 Climate Change Fellows Spotlight: Developing new cooling processes, materials, technologies, and policies for stationary and mobile applications. A group of professors at the Georgia Tech are working to develop new cooling methods for buildings and automobiles. Eleven team projects kicked off this semester as part of the Climate Change Fellows Program, which brings faculty, staff, and students together from across campus to build capacity in climate-related research, education, and community events. Marshall Shepherd: "Zombies, Cola, and Sports: Implications for Communicating Weather and Climate"
On February 11, 2019, Georgia Tech’s Global Change Program hosted Dr. J. Marshall Shepherd, a leading international expert in weather and climate. Kim Cobb testified today before the House of Representatives' Natural Resources Committee hearing on climate change. Emanuele Massetti: "Integrating Climate Change into Long-Run Macroeconomic Analysis"
On Tuesday, November 27, 2018, the Global Change Program hosted a lecture by Dr. Emanuele Massetti, Assistant Professor of Public Policy at Georgia Tech. What will happen when our cities are too hot to control and live in, can we manage? A new category called Climate Solutions was added to the Fall 2018 CIC to channel the intelligence and creativity of Georgia Tech students to help develop practical solutions that can help limit carbon emissions and curb climate change. Georgia Tech's Carbon Reduction Challenge received two first-place awards at the 2019 Reimagine Education Conference in San Francisco. Katharine Wilkinson: "Drawdown: A Path for a Warming World"
On Wednesday, November 14th, Georgia Tech’s Global Change Program hosted Dr. Katharine Wilkinson, Vice President of Communication and Engagement at Project Drawdown, a nonprofit organization with a comprehensive plan to stop and reverse the negative impacts of global warming. On August 21, 2018, members of the Savannah community learned about the new Smart Sea Level Sensor Project from Georgia Tech researchers and their City of Savannah and Chatham County collaborators. A Georgia Tech undergraduate student teamed up with Chick-Fil-A staff over the summer to reduce millions of pounds of heat-trapping greenhouse gases while delivering significant cost savings. Four Georgia communities developed and will implement smart design solutions to some of the biggest challenges facing the state. The projects, which tackle housing, traffic congestion, sea level rise and shared autonomous vehicles, are supported through the Georgia Smart Communities Challenge. Thanks to a new partnership between Georgia Tech, the City of Savannah, and Chatham County Emergency Management Association, a new network of online sea level sensors may provide real-time information about the location and magnitude of coastal flooding events. A fitting tenant has first dibs on space in the Kendeda Building for Innovative Sustainable Design. For their groundbreaking accomplishments with the Carbon Reduction Challenge, Kim Cobb and Beril Toktay have been selected as the recipients of the 2018 Innovation in Co-curricular Education Award. The Georgia Institute of Technology announces the formal launch of the Global Change Program, a new initiative designed to coordinate and grow educational and research activities focused on providing solutions and creating economic opportunities at the intersection of global change, climate change, and energy. Sign up to get the latest news and events from the Global Change Program delivered to your inbox.